…An hour & 1/2 long video, worth watching entire. Charlie is a top-notch moderator, and his students asked superb questions. Though the debaters start out addressing different concerns (Siegel ~ water & Howarth ~ climate impacts), they cover enough of same ground to widen the discussion. Unlike some newscasts, you can stop & reposition video by time. At ~ 40:15 minutes, Don says he’s come to like Bob’s paper. Regarding the climate case for the next 20 years, Don basically admits Bob is likely right. I think everyone, even the non-scientifically inclined, can learn much by watching this. No one was insulted or degraded, except maybe industry. What do you think, are the content and broader implications clear? Maybe R.Howarth could use some feedback. US Chamber petitions EPA to lower gas-well emissions estimates – The Hill’s E2-Wire. Mark Ruffalo, Anthony Ingraffea, Robert Howarth – Person of the Year 2011 – TIME. 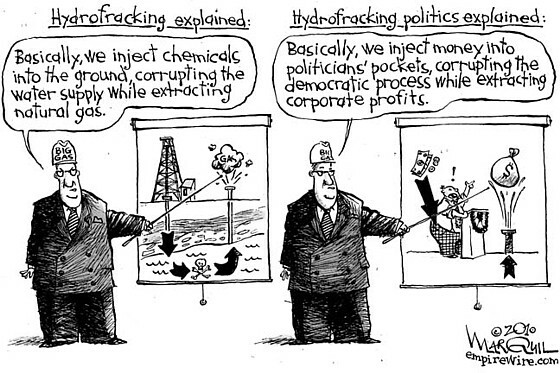 The Radio Ecoshock Show: Fracking Gas = Climate Crash. For years, governments, industry, and TV ads told us natural gas is the safe bridge fuel while we move away from dirty coal and oil. Cornell University scientist Robert Howarth wondered “Is that true?”. 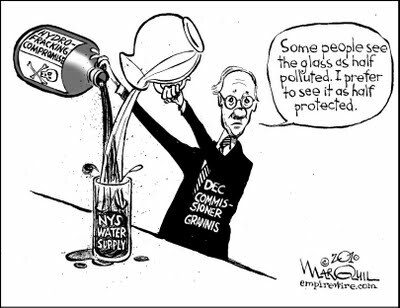 When Howarth found no science to back up big claims for the gas industry, he and a team from Cornell went to work. The results are startling. In the short-term, escaped methane from gas fracking threaten to tip us into catastrophic climate change. The total impact of the shale gas industry may be worse than coal. In the United States, where thousands and thousands of new gas wells are drilled, almost half of all greenhouse gas emissions may come from methane. The “natural” gas industry is the largest single source of methane emissions. The frackers vent loads of gases for the first two weeks after drilling, before connecting pipes. They could collect (and sell) this “waste” methane (read “climate killer”) but don’t bother. Natural gas storage facilities also vent methane as part of their designed operation. Old leaking gas delivery systems complete the job. Methane is rising in the atmosphere. New science from Dr. Drew Shindell shows in the first 20 years, methane is 105 times more powerful a greenhouse gas than CO2. Even at 100 years, Shindell finds methane is combining with other air pollution to generate an impact 33 times more powerful than CO2. Not 21, as determined in the 1990’s by the IPCC. That old figure is still being used by industry and governments. Expect a change as Shindell becomes the new lead author of this section in the upcoming IPCC. You must hear Dr. Robert Howarth explain the importance of new science on methane. he is the expert, I am not. The industry insists we only calculate methane over a 100 year period. But the latest report from the International Energy Agency (generally a conservative source) says our climate future will be determined in the next 5 years. More new science suspects the burst of methane helped tip us into a mass extinction 250 million years ago. The 20 year time frame for methane could be the jolt that tips other systems into positive feedback loops. Like igniting the peat in the Arctic. Or warming shallow seas enough to release frozen methane clathrates from the bottom (which started to happen last year). If either of those go, we are toast. Robert Howarth has taken a lot of abuse for even daring to assemble a comprehensive look at the total greenhouse gas impact of the gas fracking industry, whether it is coal bed gas or shale gas. 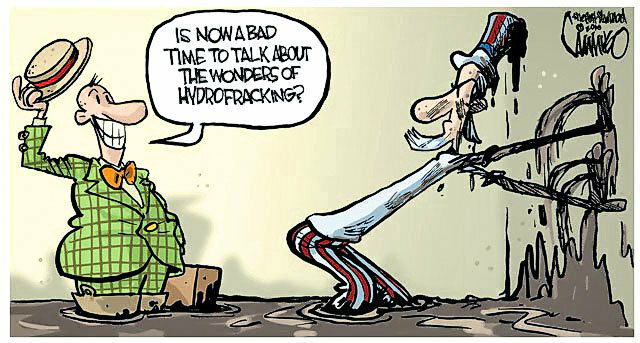 And we haven’t even discussed the fact fracking is now known to cause earthquakes, uses incredible amounts of fresh water, and risks polluting whole watersheds with a single leak of the mass toxic chemicals pumped underground. The United Kingdom may be next. With gas production from the North Sea fields down by 25 percent, there is a public relations push to get lots of gas fracking in the UK. This may be the next big environmental battle there. Fracking mania has hit Canada and Australia as well. Everyone needs to know what the latest science says. Program includes 27 minute speech by Professor Robert Howarth of Cornell at ASPO USA 2011, November 2nd in Washington D.C. Recorded by Carl Etnier of Equal Time Radio, Vermont. My thanks to ASOP USA for this fine presentation. Then a follow-up interview this week with Robert Howarth, to fill in his hurried climax of the speech – that methane emissions, when calculated over 20 years, using the new higher rate discovered by Drew Shindell – could add up to at least 44% of all greenhouse gas emissions in the United States! We discuss this, and the importance of a 2006 paper by Dr. James Hansen of NASA, on the importance of controlling methane emissions. I covered that in 2006 here for blog entry, or download the audio here. In 2006, I also put out a “Methane Primer” which is still helpful. Blog for that primer is here, and the audio for download here. But now I’ll have to revisit that piece, since like the IPCC, I was told methane was only 21 times more powerful than CO2. The science moves so fast, it is already outdated just 5 years later. Essentially, if we cannot control methane, we still lose the climate known over millenia, even if we could limit carbon dioxide emissions. Methane alone can tip us. The natural gas industry, Howarth says, is the single largest source of methane in the U.S. Shale gas fracking makes that much, much worse. We add an interview promised last week, with Samuel Labudde, about the billion dollar scam ripping off carbon credits. Companies in China are threatening to release powerful greenhouse gases, unless these fake credits are continued. Ratepayers in Europe are being blackmailed. LaBudde, a noted wildlife biologist, is also covering the climate beat for the Environmental Investigation Agency for the American branch of the organization. The lyrics in “My Water’s On Fire Tonight” is a product of Studio 20 NYU (bit.ly/hzGRYP) in collaboration with ProPublica.org (bit.ly/5tJN). The song is based on ProPublica’s investigation on hydraulic fractured gas drilling (read the full investigation here: bit.ly/15sib6). Recording credit: Robert Howarth speech at ASPO recorded by Carl Etnier of Equal Time Radio, Vermont. Speech courtesy of ASPO USA.